There are some new WWE rumors popping up ahead of WWE’s WrestleMania 34 pay-per-view this Sunday. 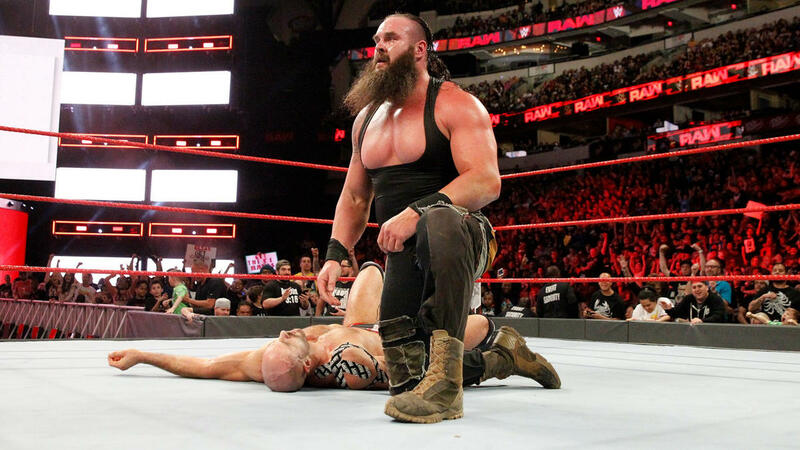 For weeks, there has been a lot of speculation over who will join Braun Strowman as his mystery tag team partner on “the grandest stage of them all.” Strowman is scheduled to take on Sheamus and Cesaro for the WWE Raw tag team titles. While he teased bringing his partner out several weeks in a row on Raw, he didn’t reveal him quite yet. Now there is a rumor over who that mystery partner will be, and it’s not Brains Strowman. According to Cageside Seats, fans might see Braun Strowman team up with his former family member. In their rumors report, they say Bray Wyatt could appear as Strowman’s partner at the big pay-per-view, as the two were formerly part of The Wyatt Family together. Adding intrigue to this situation is the fact that Wyatt was recently “deleted” via Matt Hardy’s “Ultimate Deletion” match several weeks ago on Raw. Bray was pushed into the “Lake of Reincarnation” after the match had ended and his body wasn’t found. It’s been rumored that Wyatt will return with a new sort of persona when he officially shows up again on a televised event. The tease this past week on Monday’s Raw had Braun telling Sheamus and Cesaro that he found a tag partner and he’s sorta like him but kind of different. From there, Braun went backstage and then returned wearing a white shirt and glasses, calling himself “Brains” Strowman. That was him suggesting his partner was his brother, but it could have been a hint that it was a “family member” from the past, such as Bray Wyatt. Adding to the teases is a recent Instagram story that Braun Strowman posted. The Sportster shows off a photo that Strowman has on his account for the story with Bray Wyatt seated next to him. Braun Strowman has been in a more babyface role for weeks now, leading fans to wonder if Bray Wyatt’s “reincarnation” will also have him as a babyface now. There had been some other speculation that Bray and Matt Hardy might team up in the future since Matt played a big role in his change. In addition, there had been rumors of a few other possible partners for Braun this Sunday, including The Big Show, who recently re-signed a multi-year deal with WWE, and Rey Mysterio, who has yet to really commit. Fans are just a few days away from finding out, but Bray seems to deserve a spot on the main card this year out of all those superstars mentioned. WWE’s WrestleMania 34 pay-per-view arrives on Sunday, April 8 from New Orleans, Louisiana. Fans will be able to see all of the big matches on the WWE Network, including the Raw Tag Team title matchup.